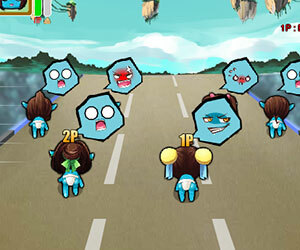 Dada Race, 2 player games, Play Dada Race Game at twoplayer-game.com. Lovely babies are in a funny race between their "Da Da" shouts. You'll have fun so much with our babies' sweet noises.Dada is now holding a race competition. There are many obstacles and items along the way. Avoid obstacles and collect items will help you win the game. Space bar - To use items. W,A,S,D - To move.0 - To use item.